testo 830-T4 infrared thermometer set | Bezkontaktní měření teploty (infračerveně) | Bezkonta | Parametr | Testo, s.r.o. 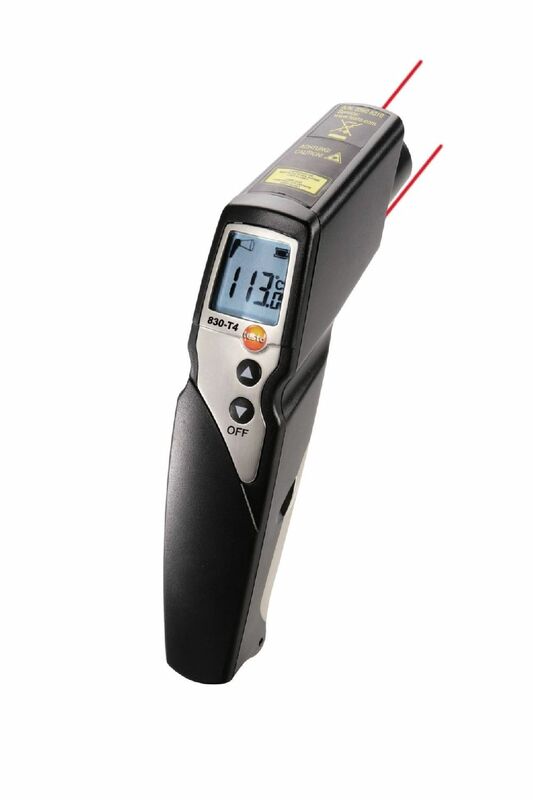 The testo 830-T4 infrared thermometer in a practical set can be used universally and enables you to measure surface temperatures in trade and industry quickly and precisely, both on a non-contact basis and with surface contact. The measuring spot diameter is only 36 mm at a distance of 1 m to the surface, thanks to the good 30:1 optics. This means that even temperatures of small objects can be reliably determined from a safe distance. For example, you can comfortably measure the temperatures of heating pipes from a standing position. The 2-point laser marking means you can always see clearly and distinctly at which location the temperature is being measured. You can also measure very small temperature differences very accurately with the precise resolution of 0.1°C. And the min./max. function enables you to set individual limit values. There is a visual and acoustic indication when limit values are exceeded. Would you also like to carry out contact measurement in addition to non-contact IR measurement (e.g. for control purposes)? Then attach the cross-band surface probe which is included in the set to the infrared thermometer. Its sprung cross-band is also suitable for surfaces which are not flat. The comparative contact measurement with the surface temperature probe will also help you determine the emission level of the surface material. This means you will be able to set the infrared thermometer emission level accordingly in order to achieve the best results in the subsequent IR measurement. 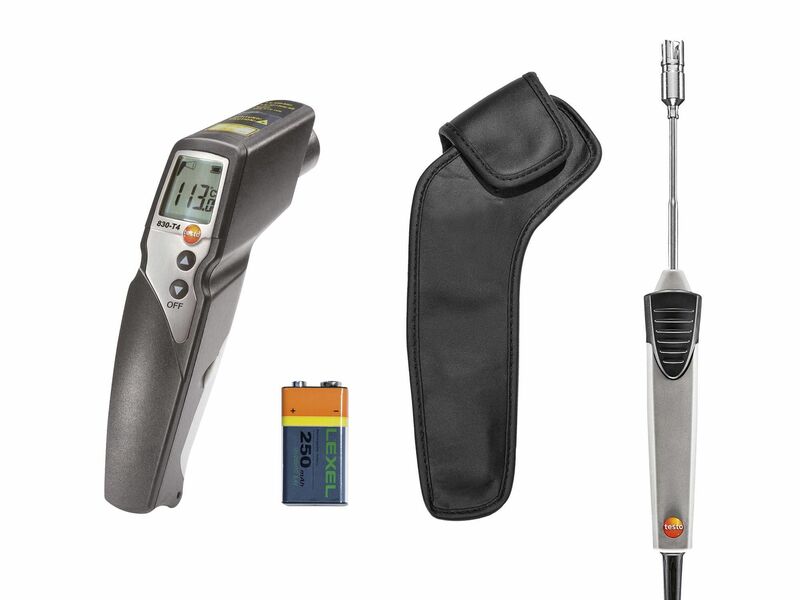 testo 830-T4 infrared thermometer, including cross-band surface probe, protective leather case, battery and factory calibration certificate.